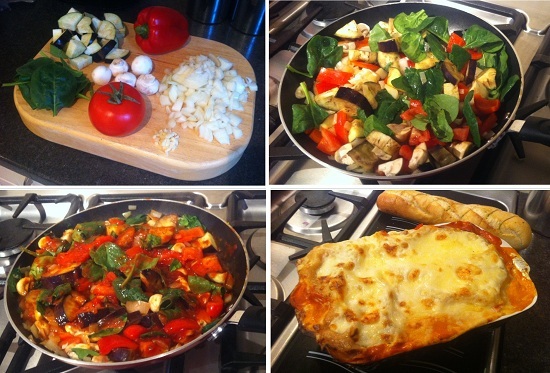 Emily's Recipes and Reviews | UK Food Blog | Leicestershire : five-a-day vegetable lasagne. just wanted to share this yummy and healthy (ish) vegetable lasagne i made for my friends at the weekend. one of my friends is a veggie so i decided to plonk as many vegetables as i thought would go together into a pan, add tomato sauce and layer up in a lasagne. this was also the first thing i've made in my new kitchen. if you follow me on twitter you'll know i've been super busy moving house lately - still got lots of posts to write up even from my old kitchen! #wiaw - my first attempt at what i ate wednesday.